High Caliber Shilohs is very pleased to announce the upcoming breeding of our beautiful and sweet girl Kiana to JnL Pocono’s handsome and fun loving boy Coz. We expect robust, healthy puppies with happy, loving temperaments, correct structure, and great movement. 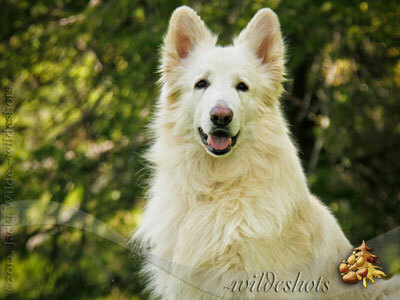 Kiana is our sweet and exuberant grey sable girl with a velvety soft plush coat. She delights in outrunning all our other Shilohs and then strutting around the yard with the ball she beat them to. Watching her move is like poetry in motion, yet in the house she is content to lie on the couch and is the biggest cuddlebug in our pack. Kiana achieved her conformation title in her first two weekends of showing and also has earned Top Dog and National Select awards and her Adult Temperament Test and Canine Good Citizen certificates. Coz is a nicely pigmented white, with a gorgeous head and great ears. He is a happy-go-lucky guy who loves to clown around. He has beautiful, flowing movement, great intelligence and confidence, and loves to learn and to please. Coz has his HIT certification and has shown excellent herding instinct. 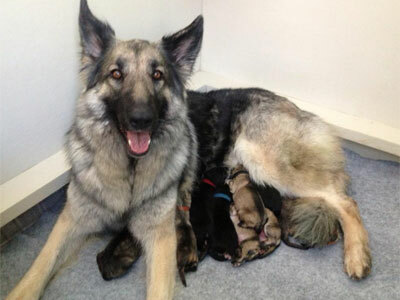 His pups have shown the potential for therapy, agility and herding. Coz has also earned his Adult Temperament Test certification, obtained points towards his conformation championship, and has excellent health testing results. This pairing will produce full Shiloh puppies with purely old line and foundation line Shilohs behind Coz, and a single outcross from Kiana, four generations back. We will have all plush puppies in this litter, with sables in various colors and perhaps a couple duals. 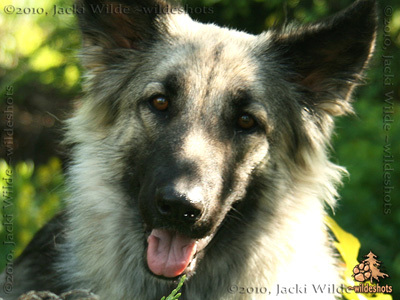 These puppies should make wonderful family members as well as have the potential for therapy work, herding or agility. If you are interested in one of these puppies, please contact us soon to reserve yours.